Hargrove's Radiant Heat series vented log sets allow you to have the most realistic looking log set with all of the heat you want. The Aspen Timbers features elegantly crafted white birch style logs with and open view ember bed for a beautiful warm glow. 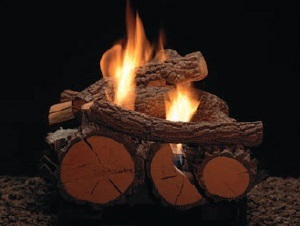 The Cross Timbers features substantial front logs, heavy bark, abundant charring, and a warm glow.